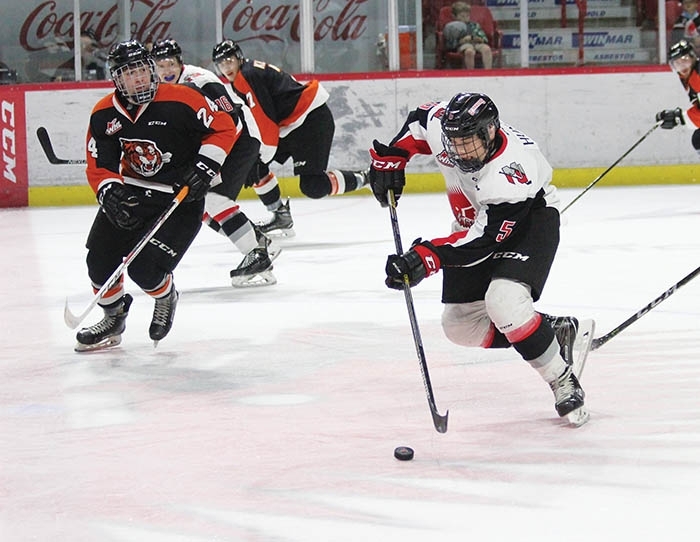 Daemon Hunt in action with the WHL Moose Jaw Warriors. Hunt has been having a fantastic season so far, and it just got better with his selection to the World Under-17 Hockey Challenge. The hockey season couldn’t be looking any brighter for 16-year-old Daemon Hunt from Moosomin. Not only is Hunt the only 16-year-old on the WHL Moose Jaw Warriors, with one goal and four assists in eight games already this season, on Tuesday Hunt found out that he was one of only 66 players selected for the Hockey Canada 2018 World Under-17 Hockey Challenge set for Nov. 3-10 in Saint John and Quispamsis, New Brunswick. The 66 players will be divided into three teams—Team Canada Black, Team Canada Red, and Team Canada White—and will compete against the Czech Republic, Finland, Russia, Sweden and the United States in their quest for a gold medal. In July, 112 players were invited to participate in Canada’s national under-17 development camp and introduced to the Hockey Canada Program of Excellence. The players chosen to represent Canada at the World Under-17 Hockey Challenge were selected by Brad McEwen (of Whitewood, Sask. ), head scout for Hockey Canada, with assistance from U17 POE management group lead Martin Mondou (Grand-Mère, Que./Shawinigan, QMJHL), as well as regional scouts Carl Bouchard (Quebec), Barclay Branch (Ontario), Barclay Parneta (West), Darren Sutherland (Atlantic), and Darrell Woodley (Ontario). Hunt said Wednesday he was still trying to process the news that he’d been chosen. Hunt says he enjoyed the selection camp and felt confident throughout the process. “The camp was really challenging physically, and mentally. It was something that I really enjoyed and really soaked up,” he says. “There was lots of good classroom sessions, lots of good on-ice learning tips. It’s players from all over Canada, and it is fun to meet all the new guys and meet the top players that are part of my caliber all across Canada. Hunt says being selected is a big deal for his career. Hunt says he feels like things can’t get any better right now. “Right now I feel like I’m playing at the top of my skill level,” he says. “I’m in the WHL right now and things are going really well, but the hockey that I’m going to be playing in the U17s is going to be really good. I’m competing against other countries, the best in the world, so I feel confident that I should be where I am right now. But honestly, I’m going day by day just trying to improve the little things that will make a difference in the long run. On top of his selection for the World Under-17 Hockey Challenge, Hunt has also been iced in every game with the Moose Jaw Generals so far this season, and had racked up five points, as of last week, with a goal and four assists. The World Under-17 Hockey Challenge opens Saturday, Nov. 3 at the qplex in Quispamsis when Finland takes on Sweden at 3:30 p.m. AT, followed by Team Canada Red, silver-medallist last year, facing off against Russia at 7:30 p.m. AT. The United States will kick off the action at Harbour Station in Saint John on Sunday, Nov. 4 when it plays the Czech Republic at 12 p.m. AT, followed by an all-Canadian match-up between Team Canada Black and Team Canada White at 4 p.m. AT. Hunt said last week he didn’t know yet which Canadian team he’d be on. More than 1,700 NHL draft picks have suited up since the inception of the World Under-17 Hockey Challenge in 1986, including 13 first-overall draft picks since 2001 (Ilya Kovalchuk, 2001; Rick Nash, 2002; Marc-André Fleury, 2003; Alexander Ovechkin, 2004; Erik Johnson, 2006; Patrick Kane, 2007; John Tavares, 2009; Taylor Hall, 2010, Ryan Nugent-Hopkins, 2011; Nathan MacKinnon, 2013; Aaron Ekblad, 2014; Connor McDavid, 2015; and Auston Matthews, 2016). Hunt was drafted in 2017 by the Moose Jaw Warriors in the first round, and was number 15 overall in the WHL Bantam Draft.